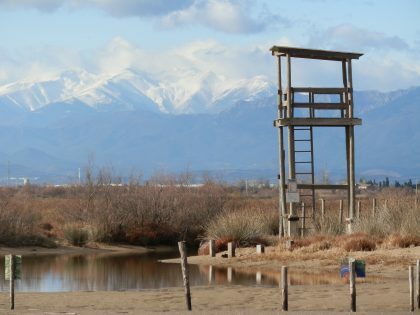 The Aiguamolls d'Emporda are a natural park of wetlands and marshes situated on the coast of the Gulf of Roses between the mouth of the Fluvia and Muga rivers between St Pere Pescador and Empuriabrava. Dedicated as a protected area, they are a haven for bird watchers. 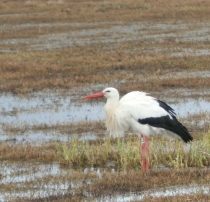 If you know of the Slimbridge Wildfowl and Wetlands reserve in Gloucestershire, then the Aiguamolls are similar, but 16 times bigger (Slimbridge is 3 sq km, the Aiguamolls are 48 sq km) and with more exotic species including storks and flamingos. Even if you aren't much of a bird watcher, the number and variety of species makes it well-worth a visit and it's not just birds. For instance we saw deer that had just left their footprints on the beach. The guide recommends a mosquito repellent in hotter months, and suggests that March and October are the best times to go for the annual migrations. 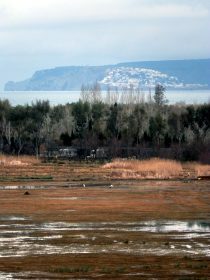 The Aiguamolls (sea marshes) were once much larger. Older maps show a large lake that extended from Castello d'Emporda to the sea. And as we've seen on other walks, the footprint of sea level and the floodwaters of the three main rivers (the Ter, Fluvia, and Muga) define the historical siting of villages but also give vast open views across the plains to the mountains in the background. The Aiguamolls themselves were originally part of a rice-growing farm that was bought by property developers who wanted to drain and canalise the land to create an extension to the neighbouring resort town of Empuriabrava. However a Catalan outcry in the mid-1970s saw the Catalan government take over the land and so the creation of the park as it is today. If you want to look at how the developers were thinking, you can visit or see the neighbouring Empuriabrava with its network of canals/marina with each house or hotel having direct access to the water and their own mooring point. As mentioned, this building only exists because of the draining of previous marshes and lakeland. So modern villages and highrise hotels are now found close to a beach whereas older villages would have been built higher up because of the risk of flooding. If sea levels rise, most of these newer resorts (including Sant Antoni de Calonge and Platja d'Aro) would be directly affected. The walk itself starts at the main information centre for the Aiguamolls. It is clearly marked as a turn-off of the road from St Pere de Pescador to Castello d'Emporda. The day we visited it started with drizzle so the photos don't have the classic blue sky you would see in summer. The landscape itself is naturally very flat with ponds and water courses reminiscent of the Norfolk broads or the Fens. The park has several itineraries and the paths are flat and broad. To watch the birds, they have placed a number of cabins (used as hides) where you can go to watch the birds. There is also information about what birds and animals to look for. 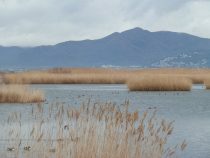 We had hoped to see flamingos (you can also see flamingos on the etangs close to Perpignan) but had to make do with storks, teals and a marsh harrier. The route we took lead from the main information point along the paths to three towers. Called sitges, these were originally used for drying rice, but when the government took the park over, one was converted into an observation tower and is now the highest point in the park. 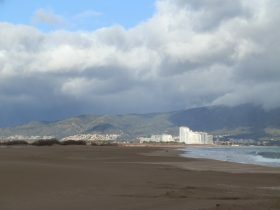 From the platform at the top you can see across the wetlands to the sea, the towns of Empuriabrava and Roses, around to the Pyrenees and to Montgri to the south. From the observation tower we continued away from the centre of the park. Eventually reaching the limits of the park and then down a road towards a campsite (closed during winter) and then followed a footpath around the campsite and down to the sea. The Aiguamolls are large so this stretch of walk from the centre to the sea is about 5km in length. In practice when we go back we're more likely to stay in the main park area and spend more time looking at the birds. At the beach is a viewing tower and we saw signs that confused us. Some signs seemed to say the beach was closed, but we had the guide-leaflet which said this stretch of beach could be walked on but is closed for breeding, between April and June. And other signs seemed to indicate that it was OK to walk but to avoid the dune-line where the animals were. In the end we decided to do the walk, but kept close to the sea. As we were walking we found deer footprints in the sand and we saw a herd of deer in among the dunes. 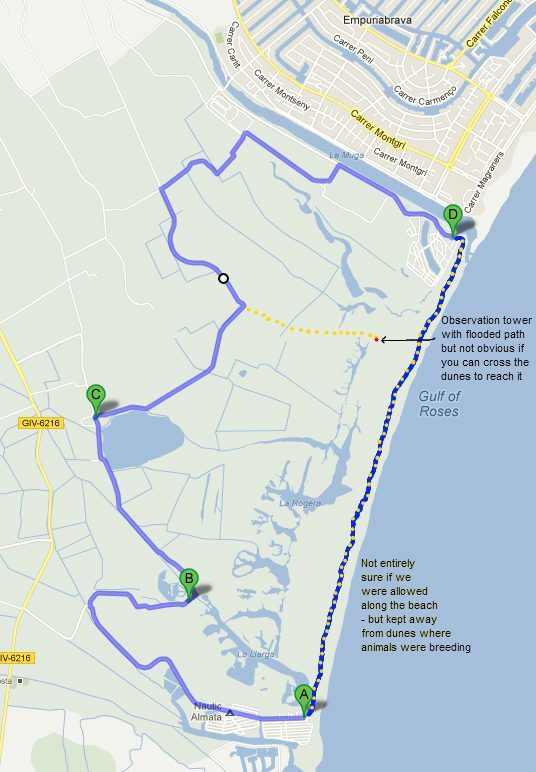 The walk along the beach is long (about another 5km) and we had hoped to re-enter the park at the next path. However, the next path was marked by another observation tower, but the route to the tower was blocked by water. We weren't sure if we were allowed to cross the dunes to reach the tower. We did try, but the path itself from the observation tower was also flooded so we ended up having to walk to the end of the beach just by Empuriabrava. The river Muga reaches the sea here and splits the beach preventing us from going into the town. Instead we followed around the edge of a campsite and then up along by the river before cutting back into the fields and finally re-entering the park in amongst cows and sheep (the sign posting isn't great around the campsite).